What I had in the old crisper. 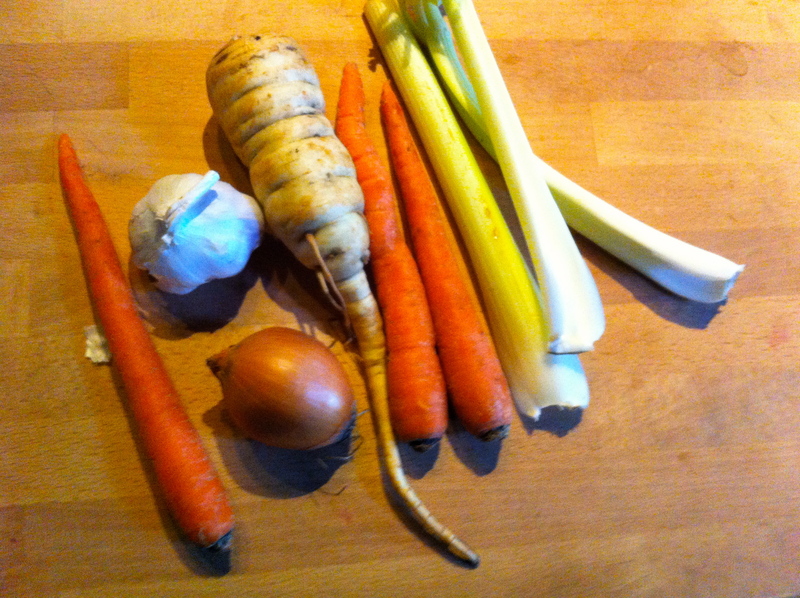 Carrots, a parsnip, celery, garlic and onion. A fantastic bunch. I don't think I ever make a soup without carrots or onion. They are considered major staples in my kitchen. 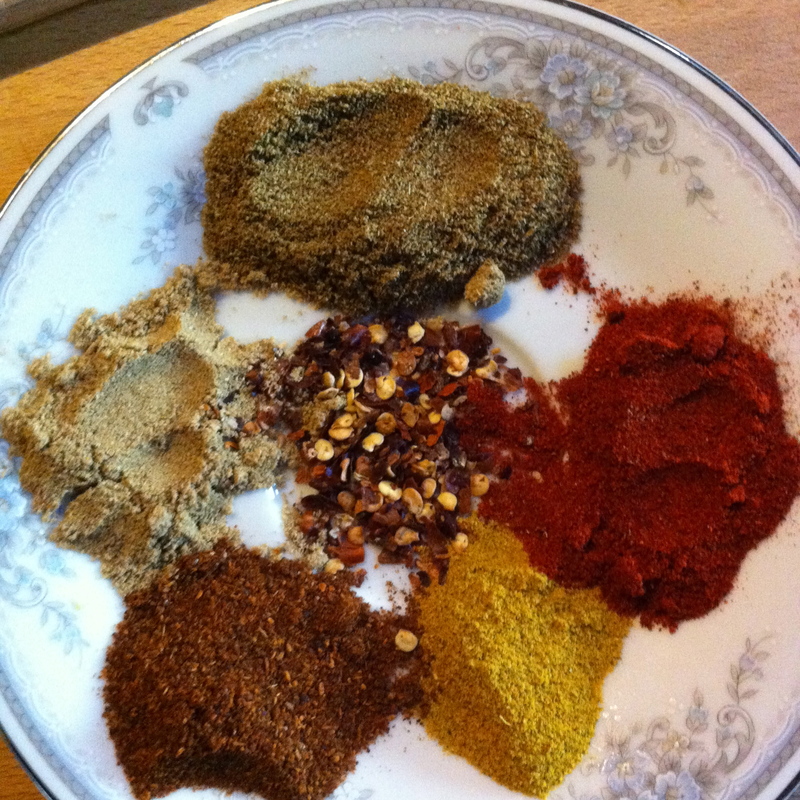 A beautiful array of spices:.Curry, cumin, red pepper, chili, paprika, and coriander. All toasty and warm spices. Perfect for those 10 below 0 days. Now doesn't this little plate look nice? You must arrange your spices like this in order for the soup to work(no not really, but it is really pretty!) Chopped up veggies sweating in a big pot. 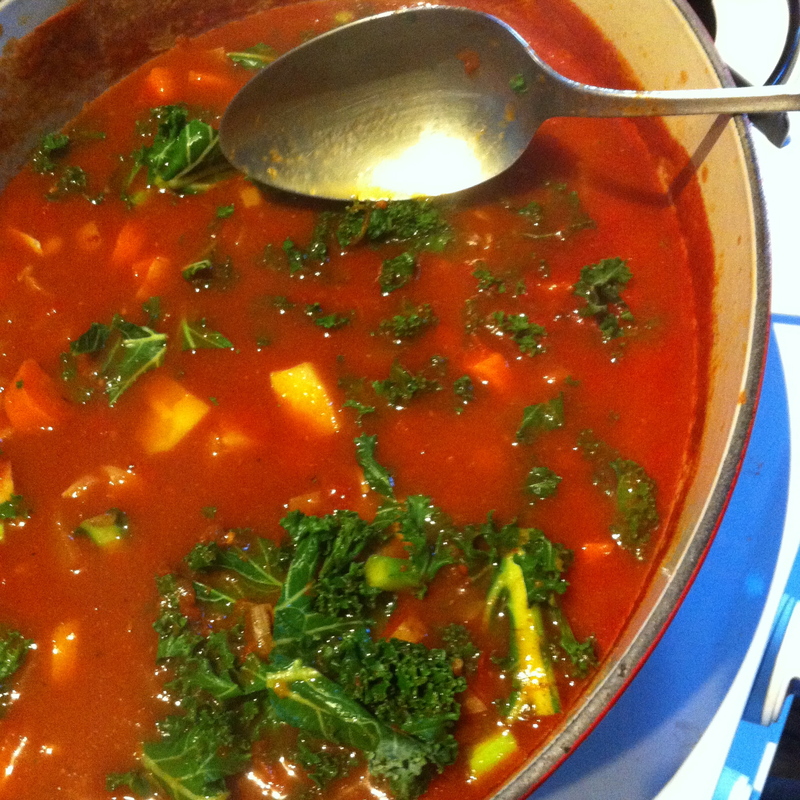 I always sweat the veggies for soup, it helps cook time, enhances the flavor of the veggies and toasts up the spices. (Throw in the spices while doing this, it helps to bring out the flavors) When I chop my veggies, I usually do not do a uniform chop, i like a few different sizes. Smaller pieces cook faster and melt a bit and bigger chunks retain more crunch and texture when cooking….But by all means chop them all the same. Just telling you what I do. 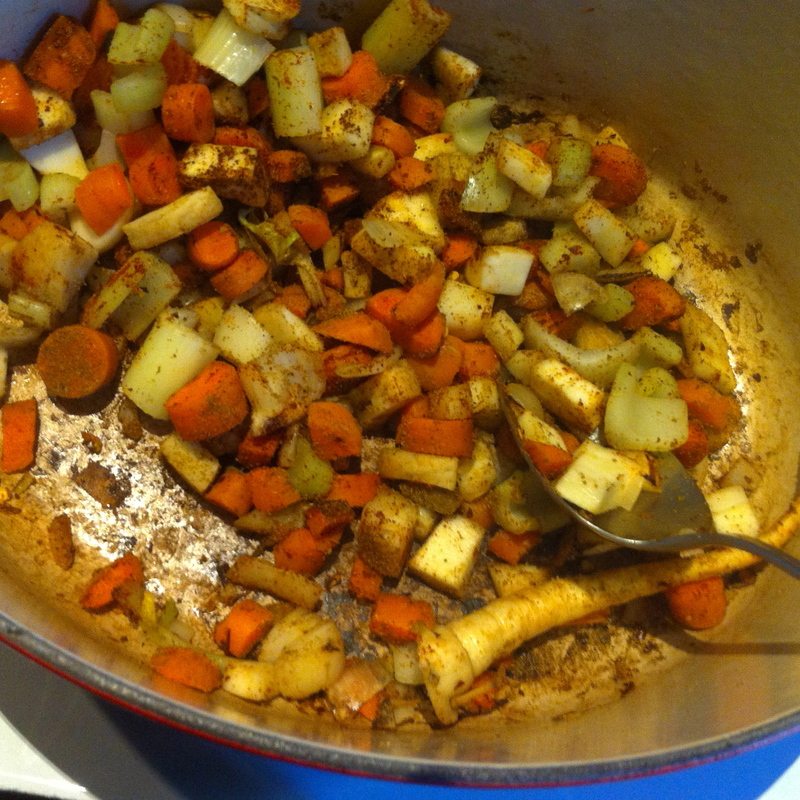 Once the veggies are tender and the bottom of the pot is starting to brown a bit, add a splash of vinegar. Mix for a minute to dislodge stuck on veggies than in goes the tomato base. 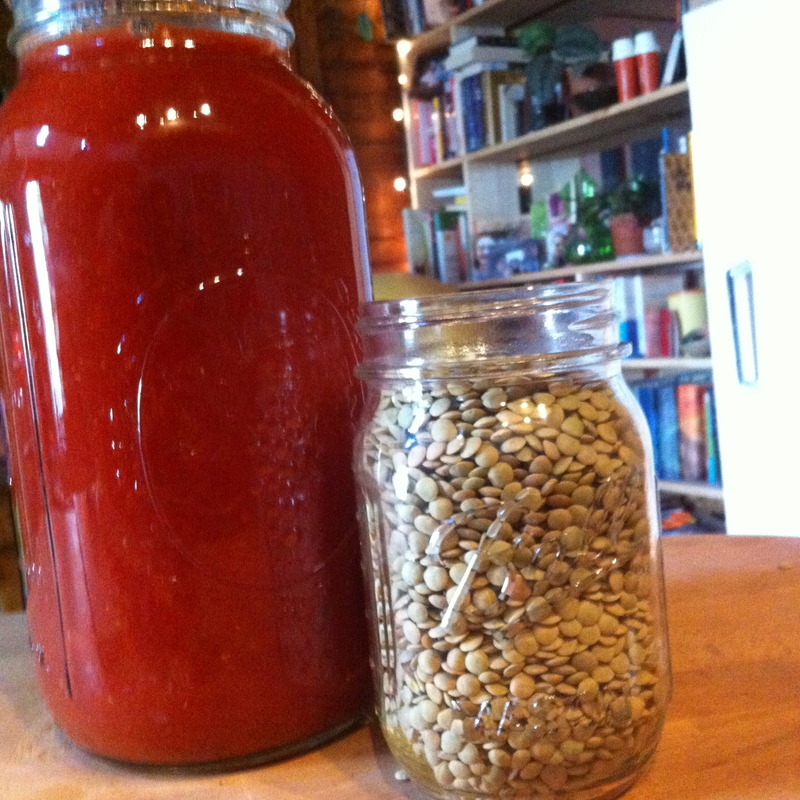 I buy big cans of San Marzano tomatoes, use what I need and refrigerate the rest in a big ball jar. I use the whole can within a few days. (Seriously, I soup every day). If you don't use a lot of tomatoes, just use a 28 oz can. Crushed or whole is the way I go, but whatever floats you boat works too. Anyways, you got the tomatoes in so now dump in the lentils and a bit of water.. I'll give you measurements, but honestly, I just usually throw in half a jar or lentil and whatever water is left in the teapot. You can never have to many lentils and if you go to heavy on the water, you can just cook it down. No biggy. A handful of a hearty green helps to add depth, texture, color and flavor. 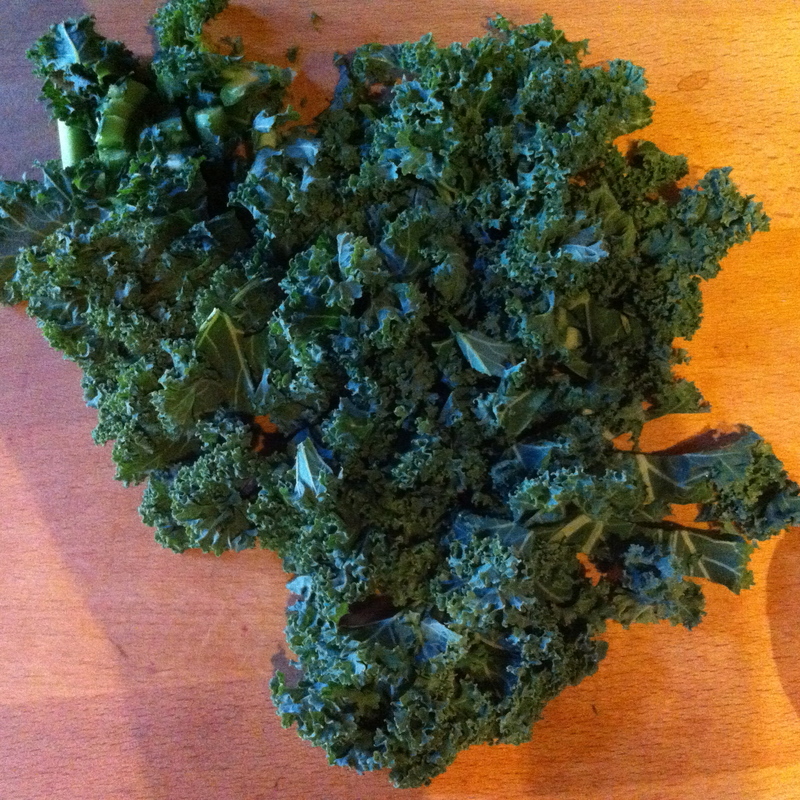 I love kale in soup. Chop it up into small pieces and throw in a the last-minute. It's fine to add it in at the beginning with the tomato and stuff, but I find I like the texture and flavor better when I add it towards the end. 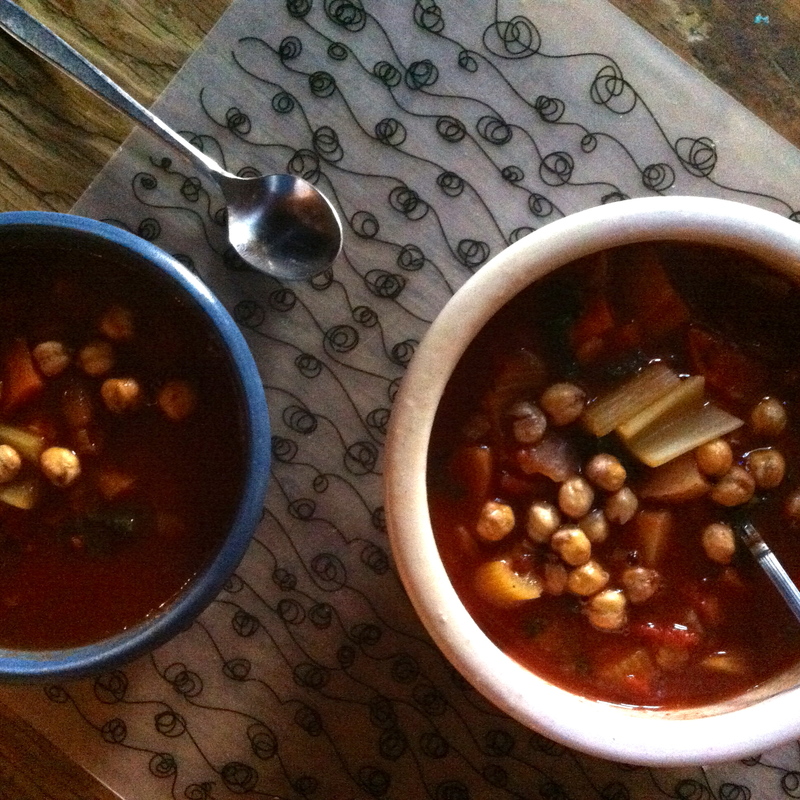 Topped with a few roasted chick peas that I just happen to be snaking on when I was serving up the soup.. Crunchy chick peas are good on anything. Try it, but don't worry about it if you don't happen to have any on hand. You can add anything you like if you want a little crunch. Maybe some toasted squash seeds or some cracker crumbs. Or nothing. You don't need anything here, this soup is good enough without it. 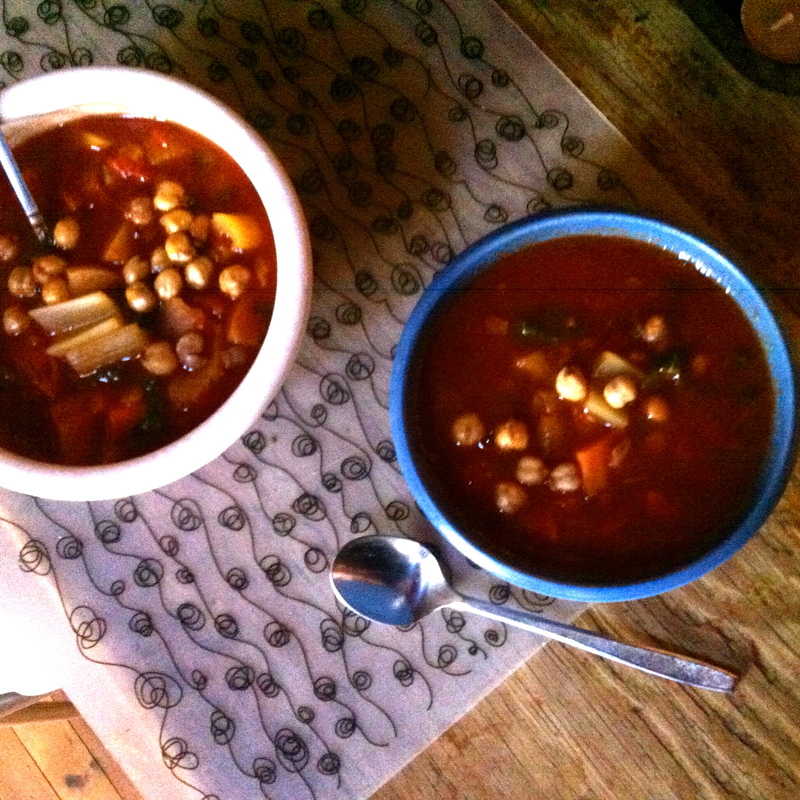 And that the soup. Hearty and warming, keeping my bones from the death grip of the cold. P.s. 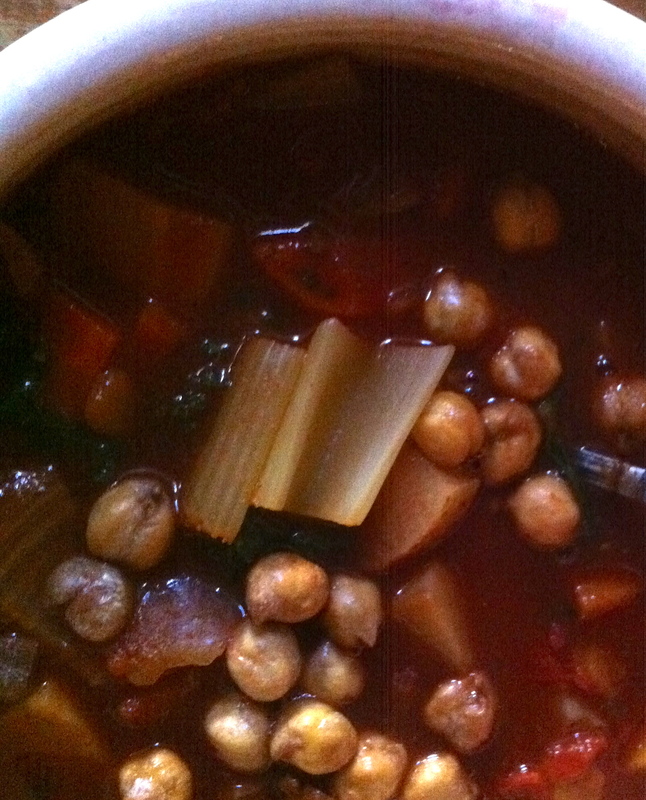 Make a double batch of this soup…Left overs are the best and take a few minutes to reheat. Rough chop the carrot, celery, onion, and parsnip and place in large pot with a dash of salt and pepper. Place on medium heat with lid and let the veggies sweat for about 5 minutes. Chop garlic and add along with spices and vinegar.Replace lid and let cook for another 5 minutes. Remove lid and add tomatoes, water, and lentils. Bring to a rolling bowl then reduce heat to low and give a good stir, making sure to scrap the bottom of the pot to dislodge any stuck veggies. Replace lid and simmer for another 20-30 minutes, stirring on occasion. 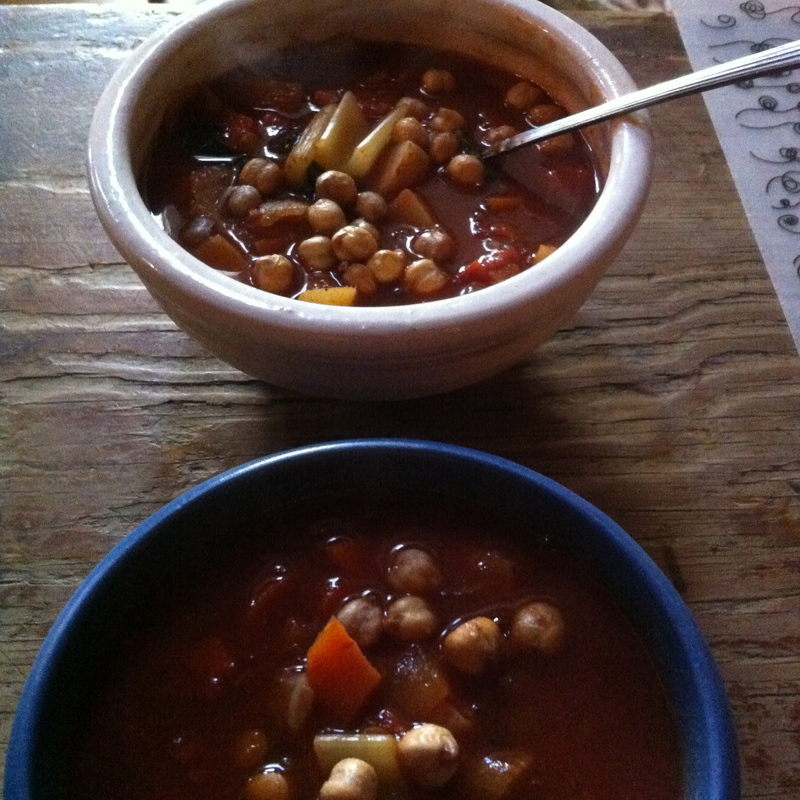 Soup is done when the veggies and lentils are cooked to your liking. This is when I add kale. Small chop the leaves and throw into pot and stir. Let sit in hot soup for a few minutes.